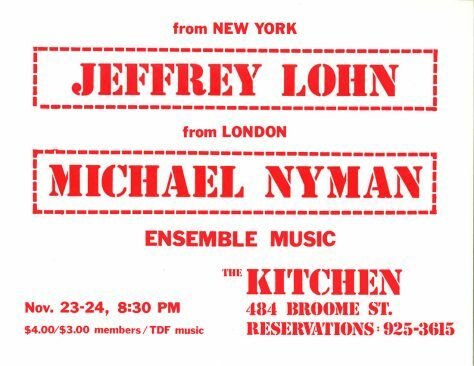 As part of The Kitchen's Contemporary Music Series, composers Jeffrey Lohn and Michael Nyman presented recent compositions. Following his first concert piece at The Kitchen earlier that year, Lohn's untitled piece was the second installment of three in a series of works for a female chorus and strings. Its performance was conducted by Julius Eastman. Michael Nyman and his London-based band presented five compositions, with techniques that deconstructed classical music, exploited popular music, and toyed with experimentation.